Coin collecting is not just a fun and exciting past time but a great way to diversify your investment portfolio into precious metals. Adding American Eagle gold coins or Gold Buffalo coins into your possession is very highly regarded among coin collectors and investors alike. However, before investing, learn 7 interesting facts about Gold Buffalo coins you might not have heard before. 1. Gold Buffalo coins are the very first coins in the American mintage history being minted from the purest form of gold, 24 karat. This allows American Buffalo gold bullion coins to compete with other 24 karat International gold bullion coins. Before 2006 all gold dollar coins were minted from 22 karat gold exclusively. 2. Gold Buffalo coins were originally minted in 2006 and wear a proud image of an Indian Chief profile on the face side and American Bison on the flip side. Some coin experts believe that not one but three American Indian Chiefs became the prototype for creating this Indian Head design. Very often Gold buffalo coins are compared in design to Indian head coins. 3. 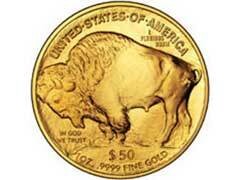 Do you know why the Gold Buffalo coins wear an image of an American Bison on the back but are called Buffalo’s? There’s a lot of conflicting information on the subject, however it all boils down to linguistics. Historically, American Buffalos were called “boefus” by some French animal traders in the 1800’s, hence the name buffalo. 4. In the year 2006 when the coin was minted, it was worth around $800, now in September 2011, one ounce Gold Buffalo coin has reached its record mark of $1,900 including the premium (prices vary by gold coin dealers). 5. James Earle Fraser was an American sculptor who designed the images used on the famous Buffalo and Indian head coins in the 1900’s. All his life James Earle Fraser was deeply touched by hardships of native population of America which was expressed in his works. 6. Out of all Gold Buffalo’s coins minted, gold coins of the first strike and limited edition proof coins are the most prized among coin collectors and could be sold for hundreds of dollars higher than their actual value in gold. 7. 2008 was a remarkable year in the history of the Gold Bufallo’s as the American Government stopped the sales of the coins to the public due to extreme demands because of economic downturn.